$240.00 Supreme Soviet of the USSR membership badge, screw back, unnumbered, 1970-1979 issue. In very fine to excellent condition. Includes original silver screw plate. $290.00 Supreme Soviet of Armenia membership badge, screw back, numbered (#46), 4th Convocation, 1955. Early version of the badge, with different characters in the inscription compared with the more common later versions (the first letter looks like a Latin "Z".) Also features early version of the mint mark "MD". This is a relatively scarce version of the badge, issued to only 300 delegates. Excellent condition. $240.00 Supreme Soviet of Azerbaijan membership badge, pin back, numbered, 1971- 85. Very fine to excellent condition. $330.00 Supreme Soviet of Georgia, screw back, numbered, 5th Convocation, 1959. Very early issue with stamped maker mark "MD". Excellent condition. $290.00 Supreme Soviet of Georgia membership badge, X Convocation, pin back, numbered, 1980. In outstanding, excellent condition. $230.00 Supreme Soviet of Ukraine membership badge, screw back, numbered (#288), 6th or 7th Convocation, 1963 / 1967. In excellent condition. $250.00 Supreme Soviet of Uzbekistan membership badge, pin back, numbered, 1971-1980. In very fine condition. $590.00 Supreme Soviet of Chuvash Autonomous Republic membership badge, pin back, numbered, 1971 - 1985. In excellent condition. $470.00 Supreme Soviet of Karakalpak Autonomous Republic membership badge, screw back, numbered,	4th Convocation, 1955. Scarce badge to one of only 148 members of this convocation. In outstanding condition. $45.00 Regional Soviet membership badge, Kazakh Soviet Socialist Republic, circa 1960s-70s. A very attractive, relatively large size badge in brass and enamels. Excellent condition. $10.00 District Soviet membership badge, Kazakh SSR, circa 1980s. In excellent condition. $25.00 District Soviet membership badge, Latvian Soviet Socialist Republic, circa 1970s. In white metal . Excellent condition. $20.00 Village Soviet membership badge, Latvian Soviet Socialist Republic, circa 1970s-80s. In excellent condition. 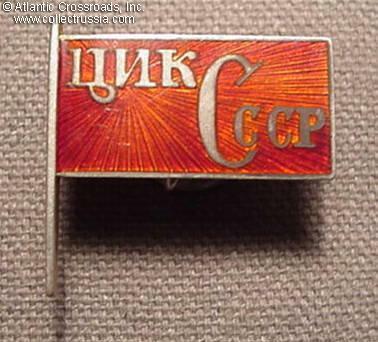 $35.00 City Soviet membership badge, Lithuanian Soviet Socialist Republic, circa 1960s-70s. In brass and enamels, fine quality badge in excellent condition. $40.00 District Soviet membership badge, Lithuanian Soviet Socialist Republic, circa 1960s-70s. Excellent condition. $25.00 Rural District Soviet membership badge, Lithuanian Soviet Socialist Republic, circa 1960s-70s. $35.00 Local Soviet of People's Deputies, membership badge, Armenian SSR, 1990-91. Uncommon badge issued only once just before the collapse of the Soviet Union. In excellent condition. $15.00 Village Soviet membership badge, Armenian SSR, 1970s-80s. Excellent condition.